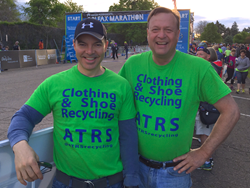 For the second consecutive year, the ATRS Green Team will be at the Start Line recycling all dropped warmup gear and accepting donations to benefit Colorado Adaptive Sports Foundation. As local Coloradan runners warm up and stretch out for this weekend's Kaiser Permanente Colfax Marathon, volunteers from American Textile Recycling Service (ATRS) and Colorado Adaptive Sports Foundation (CASF) are preparing for a different kind of competition on the course. The two organizations are aiming to beat their PR from last year, measured not in minutes and seconds but instead in pounds. For the second consecutive year, ATRS has been invited to help keep the RunColfax course clean and green by picking up and recycling all dropped warmup layers from the Start Line. Every donation benefits CASF, a nonprofit organization that allows adaptive athletes of all ages to compete on local, national and international levels. Eleven volunteers representing each CASF sport will join the ATRS Green Team on the course to accept clothing, shoes and other running gear donations. The Clothing & Shoe Donation partnership operates like a year round nonprofit fundraising program. CASF receives monthly funding for every pound of textile donations dropped off in neighborhood ATRS bins or at local events like the Colfax Marathon. This funding helps the nonprofit provide equipment and practice sessions for Coloradan athletes with disabilities. Last year, 500 pounds of usable clothing were donated at the start line. ATRS hopes to inspire Colfax Marathon runners to break this record in 2016. Weather forecasts for Sunday predict temperatures as low as 48 degrees in the morning as Colfax Marathon and Half runners are lining up. Participants in these races are encouraged to wear a sweater or jacket to keep warm while waiting in the corrals, then discard these outer layers before passing the start line. Runners can also bring additional bagged donations of gently used training apparel and sneakers to drop on the side of the corrals for volunteers. Centennial State residents don't have to run in the Colfax Marathon on Sunday to support CASF with their clothing & shoe donations. To find a year round bin, simply call the ATRS 24-Hr Hotline at 866-900-9308 or visit http://www.atrscorp.com. Every donation touches so many lives by providing local adaptive athletes the opportunity to compete, build relationships and develop lifelong skills. The 11th annual Kaiser Permanente Colfax Marathon takes place May 14-15, 2016. Events include the full marathon, half marathon, marathon relay, Urban 10 miler and Colfax 5K. Established by the cities of Aurora, Denver and Lakewood to encourage Coloradans to be healthier, the marathon has established itself as an iconic race for the mile-high city. We support local charities and nonprofits by providing one of the country's biggest fundraising platforms though our Charity Partners Program. We are proud to partner with corporate sponsors who make our race a success, including: Kaiser Permanente, DaVita, 9News, The Denver Post, Comcast, Jim 'N Nick's Bar-B-Que, Clif Bar, Michelob Ultra, Alice 105.9 and The Mountain 99.5. Visit us at http://www.runcolfax.org, facebook.com/runcolfaxdenver and on Twitter @runcolfax.